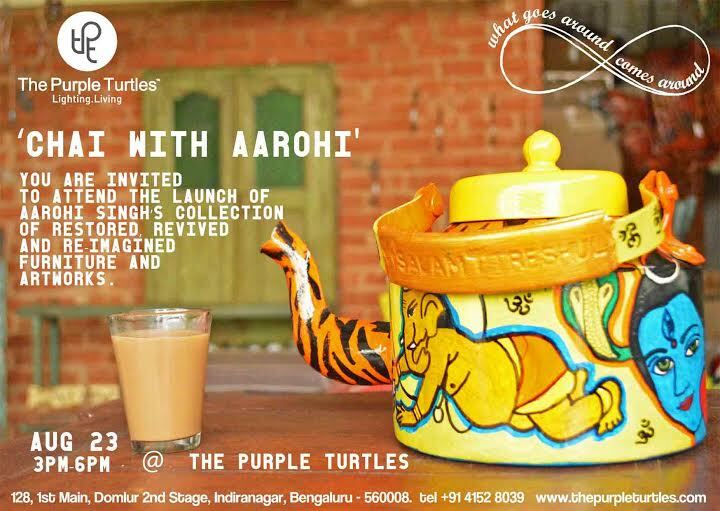 I am delighted to share with you all that my line of up-cycled and painted furniture will now be available at The Purple Turtle store here in Indira Nagar, Bangalore, India. ‘My work is about connections. And the idea of using something already existing and infusing it with fresh perspective to enhance pre existing memories on a given piece is really what dreams are made of for me. With each of these pieces that I rework I am looking to add a newer more contemporary dimension to an old weather beaten piece. A box, a chair, a trunk. Something that has history in its very grain, the nuts and bolts, the handles that maybe broke because of the strain of carrying a lifetime of someone’s personal belongings. I don’t particularly like the term vintage to describe what I work with – covered in layers of history seems truer. It may have to do with the fact that I hold a Masters degree in History. Memory and story are important to me. They connect. You can read about the story behind some of the pieces here, here and here. Some of these pieces will also be available at the ongoing Art Bengaluru exhibition on at UB City here in Bangalore from the 21st of August to the 30th. This entry was posted in Acrylics, DIY, Event, Exhibition, Furniture, Graphic, Happy Happenings, Interiors, Re-use, Re-work, Roots, Upcycle. Bookmark the permalink. Do u undertake upkeep of furniture??? Am looking for a coir weaving for my wooden sofa set.. literally fed up searching for one… I don’t want to go for expensive ones.. fabindia was ready to do it but on a premium price. 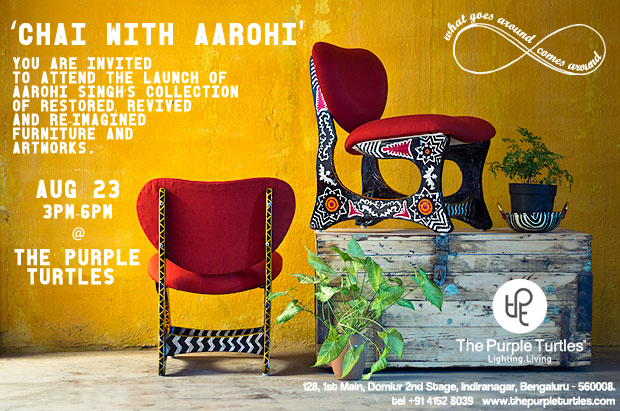 Please let me know whether it will be possible for u to take coir weaving for my sofa set. If so, please let me know how to reach you?! Sorry about I don’t do upkeep of furniture. You could try some shops in Thipsandra….